Duval County’s primary elections will be held on Tuesday, March 19th when voters will head to the polls to vote for City Council, Mayor and other local offices. Several City Council races have multiple candidates vying the contested seats. 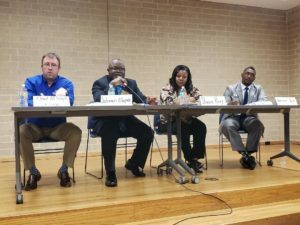 Last week, the Duval County Democratic Party Black Caucus held a District 7 Candidate forum at Highlands Library on Dunn Avenue. Issues discussed included infrastructure, schools, neighborhoods, crime and leadership. 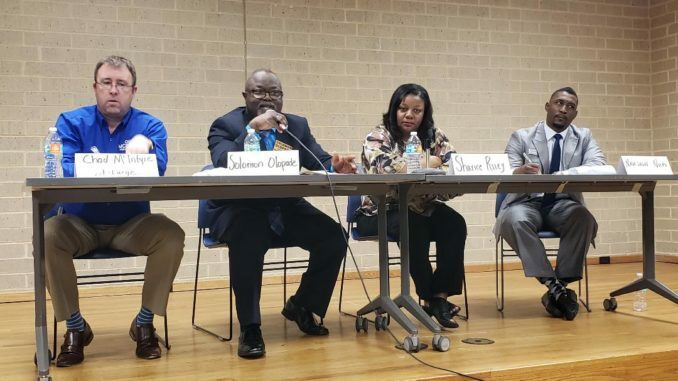 Each candidate fielded questions from the community and detailed their goals to make amends for former council members past oversights and errors. For many years, Jacksonville’s city council races remained under lock down with veteran candidates often rotating among legal seats. This year marks one of the rare openings where new candidates can make a breakthrough due to the legal issues and term limits of many sitting members. Candidates in attendance offering fresh perspectives and an example of their representation were Chad McIntyre, Solomon Olopade, Sharice Riley and Nashon Nick. Also in the audience were candidates running for sheriff and at large seats. In the following weeks, several candidate forums are scheduled around town to allow contenders an opportunity to address the public. According to the Supervisor of Elections office, Jacksonville holds unitary elections for their consolidated government. The first election is held with a single ballot for all voters within each electoral district, regardless of political party affiliation. Candidates appear on the ballot with party labels and campaign as party candidates. Any candidate winning a majority of votes in the primary is elected; if no candidate for a position wins a majority, the general election serves as a runoff between the top two winners, regardless of party affiliation. The General Election is scheduled for Tuesday, May 14, 2019.